How do Christmas celebrations differ around Europe? (Saint Nicolas in north-eastern France). Greece Aghios Vassilis / Άγιος Βασίλης (Saint Basil) on January 1. Hungary Baby Jesus (Jézuska), (Grand) Father Winter (Télapó) before 1990. Italy (Napoli) Babbo Natale on December 25, la Befana on January 6. Poland Saint Nicholas, although it can differ by regions. Portugal Baby Jesus, traditionally. But it’s changed to Pai Natal or Santa Clause. Russia Ded Moroz, or (Grand)father Frost for putting under the New Year’s tree. Spain The three kings – Melchior, Caspar and Balthazar – bring gifts on January 6. 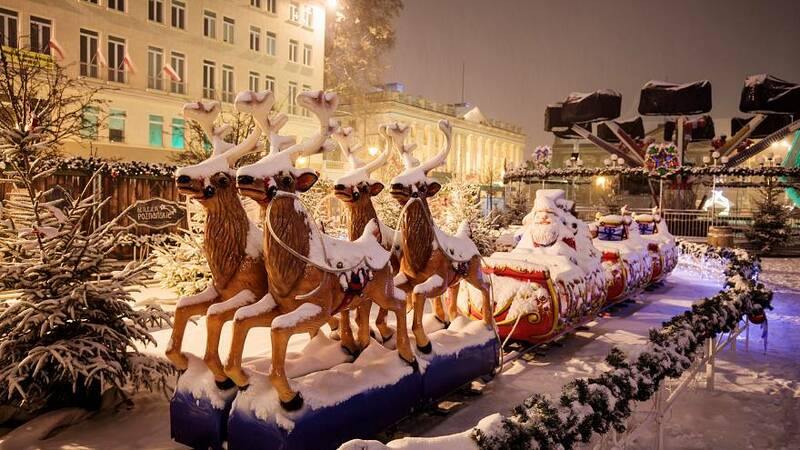 Ukraine Saint Nicholas or Grandfather Frost on December 19. What is eaten traditionally on Christmas Day? England A roast turkey dinner is most common, served with roast potatoes; vegetables, including the one everyone loves to hate, Brussel sprouts; Cranberry or bread sauce and gravy; and small chipolata sausages wrapped in bacon, (colloquially known as pigs in blankets). Dessert can be Christmas pudding, (a cake of dried fruit sometimes flambéed in brandy), mince pies with cream or custard, Christmas cake, (dried fruit cake with icing), or yule log. France Foie gras, smoked salmon, scalops, oysters and snails are a favourite for starters during Christmas meals. The main dish is almost always meat, be it roast turkey, capon or goose; with roast beef, game, and ham also on the menu at times. It is not an easy task to be a vegetarian on Christmas in France. Dessert is usually a Yule log cake with a very rich chocolate, butter or cream frosting. Germany Many Germans prefer a simple meal on December 24 to avoid extra work or drama on that special day. This meal is often “Würstchen mit Kartoffelsalat”, (Wiener with potato salad). On the 25th and 26th, (when Germans visit the different branches of their family), dishes are often more complex with roasted duck, goose, or beef. Greece Traditionally, the main course of Christmas dinner in Greece is roast pork, with a variety of side delicacies. Christmas turkey has become popular in recent years. Melomakarona and kourabiedes are the two varieties of Christmas and New Year’s cookies in Greece. The first is made with semolina, cinnamon, and clove cookies drenched in honey, while the second is with rosewater and fresh butter cookies sprinkled with powdered sugar that are normally served at New Year. Christopsomo is the bread that is made on Christmas Eve, which has a cross carved into the top crust before it is baked. Hungary Fish soup or poultry is the main dish. Traditional desserts are poppy seed rolls or nut rolls. According to traditional beliefs the fish scales represent money, poppy seeds bring luck and happiness, while the walnut is a symbol of richness. Eggnog is usually a part of the menu as is kocsonya, ( a meat jelly made of thick broth). Italy December 24th standard menu: Octopus salad – Vermicelli a vongole, (a kind of spaghetti, the one we use for fish condiment, with clams), Spigola all’acqua pazza, (sea bass), Baccalà fritto, (fried salted codfish), Capitone fritto, (fried large eel), with an Insalata di rinforzo, (Salad with cauliflower, anchovies, olives, and various pickles). As desserts panettone and pandoro are popular in the North of Italy, with pastiera, struffoli e cassata in the South of Italy. December 25th standard menu: Cold pork cuts and hams, oven-baked pasta filled with chicken or turkey, braciole di manzo, (meat chops), the Insalata di rinforzo again, and frittura di paranza, (mixed grill of fish, shrimps, squids, etc.). Poland The most important meal is the dinner on December 24, when dishes include carp, red borscht soup with uszka, (small stuffed raviolis), and cabbage with mushrooms. It is a meal without meat. Portugal They eat a very simple meal of boiled cod and assorted vegetables on Christmas Eve. On Christmas Day, most families eat a roast of goat with potatoes, while others go with turkey or chicken. Russia Salads, champagne and caviar for New Year’s Eve. Selyodka pod Shuboi, or “Herring under a Fur Coat” is a layered dish filled with herring, potatoes, carrots, beets, onions and mayonnaise. The beets give the salad its purplish color. Olivier salad, also called Russian salad in some countries, is made with mayonnaise, potatoes, carrots, pickles, green peas, eggs and chicken or bologna. The champagne is usually the “Sovietskoye” variety, available everywhere from Kamchatka to Brighton Beach. The caviar is usually red and served on buttered bread. Spain On the day of giving presents, (January 6), people eat “roscón de reyes”, (king cake), and turrón, (almond nougat candy). On the night of the 31st you are supposed to eat a grape for every strike of the clock at midnight. Turkey The special dish on New Year’s Eve, is, appropriately, turkey. Ukraine The day before Christmas, January 6, they have a big meal with a dozen dishes, symbolising the 12 apostles. The dishes can be drinks too, (but not alcoholic). One of the most common dishes is kutya, a dessert made from wheat or rice, with nuts, raisin, poppy seed, honey. What other traditions are there around Christmas? England Christmas Day can include a morning visit to church followed by present-giving and a festive dinner. Many watch the Queen’s Speech on television in the afternoon. Of course, it is also an occasion rich in comic possibilities. The day after Christmas is called Boxing Day. Its origins are from the upper classes giving their servants and tradesmen gifts, known as a Christmas box, to thank them for their efforts over the year and for working on December 25. These days the day is dominated by football. In Scotland New Year’s Eve is celebrated more than Christmas Day. It is also a time of year when seasonal pop songs take over the airwaves and shopping centres, many of which are awful. Here are two that are heard a lot at this time of year that are not. France Christmas is private and family-oriented. Since France is not a very religious country, not a lot of people go to Christmas Mass on December 24. Gifts are usually opened late on Christmas Eve. But others can be offered on Christmas Day, which is usually celebrated with the side of the family not seen the evening before. Germany Christmas is celebrated on December 24. One tradition is to put up a nicely-decorated crib. Each day Mary and Joseph approach the crib a little more. Finally the Baby Jesus is put inside and the shepherds come to visit. Greece Christmas carol-singing, (kalanda), on December 24 and 31 and January 5. Children on the islands sing carols door to door, taking Christmas boats with them to light the way and store the treats they are given. Hungary Gifts are given on December 24. The tradition of Christmas carols has remained strong in villages, where people dress up as characters of the biblical nativity story of Christ. Italy Midnight Mass, and in some villages there is Presepe vivente, (a representation of the nativity scene). Poland At dinner time the Poles always put out one more plate on the table, in case anyone arrives unexpectedly, in the hope that no-one is alone at this time. According to a tradition from a central region, animals can talk at midnight on Christmas Eve. Portugal Presents are opened after Midnight Mass or early Christmas Day morning. Russia Christmas in Russia is celebrated on January 7, according to the Orthodox calendar. Holidays start from December 31. Every year television broadcasts, and people delightedly watch a comic drama, Ironiya Sudby Ili’s Legkim Parom, or “The irony of fate, or Ènjoy your bath”. Spain Christmas celebrations start with the El Gordo, (the big one), lottery, which drives everyone crazy! This year’s prize was 2,24 billion euros, and drawing the winners can take up to five hours. The Day of the Holy Innocents (December 28) is like April Fool’s Day, with people doing jokes and pranks. In Catalonia they put a figurine named Cagener, (the crapper), in nativity scenes. The figurine wears the traditional Catalan red cap, and his trousers are left down, showing his bare bottom. Turkey Christians in Turkey are mainly orthodox and so celebrate Christmas from January 6. On this day there is a tradition called bogaz’da hac. A priest throws a wooden cross into the water and people jump in to save it. There are no Christmas trees. Instead one is decorated at New Year, when presents are also given. Ukraine Orthodox Christians celebrate Christmas for three days from January 7. In some regions they go to the cemetery the night before Christmas to put candles on their relatives’ graves. Youngsters go door to door dressed as characters from the Nativity scene, a practice called Vertep.